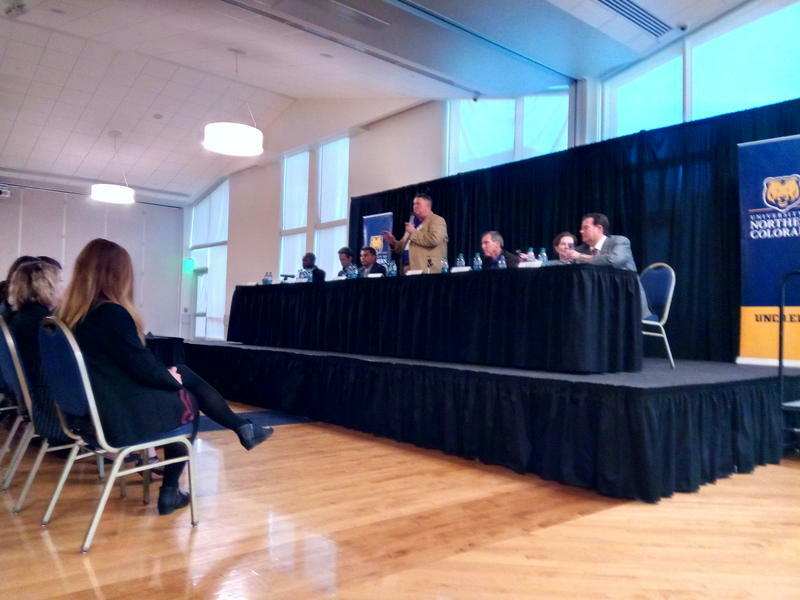 When asked what they thought the defining issue facing Colorado is, the panel of seven candidates at Monday night’s gubernatorial debate in Greeley couldn’t pick just one. “The most important thing the next governor has to do is to build a coalition statewide to go to the ballot and repeal the worst parts of TABOR to build schools,” Mike Johnston, a Democrat, said to the crowd of 100 people in UNC’s University Center Grand Ballroom. Fellow Democrat Erik Underwood echoed Johnston’s concerns, but was quick to call him a “Johnny-come-lately” on repealing TABOR. Doug Robinson, a Republican, said he had multiple priorities but pointed to the future of the state’s transportation infrastructure as a critical issue. Lt. Gov. Donna Lynne, a Democrat, said it was mistake for a gubernatorial candidate to prioritize one issue over others. Libertarian candidate Scott Helker urged voters to avoid polarizing language in the upcoming midterm elections. Republican Greg Lopez said he was most concerned about Coloradans being able to have mature, productive conversations about key issues like transportation and education funding. Fellow Republican Steve Barlock said securing the future of the state’s water sources was his main priority. Monday’s conversation, moderated by Denver 7News anchor Anne Trujillo and UNC political science lecturer Gregory Williams lasted more than two hours. The candidates fielded questions on everything from sexual harassment in the workplace to more lighthearted questions about if the candidates would rather be stuck in an elevator with President Donald Trump or former President Barack Obama. Democratic candidates across the board adamantly opposed arming teachers with guns and favored stricter gun control legislation. Republican candidates were less intent on tightening gun laws. When asked about their stances on LGBT rights in Colorado, all candidates said they would represent people equally no matter their sexual orientation. The Greeley Tribune live streamed the event on Facebook. Not all the candidates hoping to replace Gov. John Hickenlooper this fall participated. Early favorites Walker Stapleton, Cary Kennedy and Jared Polis were not present – but are expected to attend their respective parties’ state assemblies this weekend. John French, an unaffiliated candidate, was scheduled to participate in Monday’s debate but did not attend. This entry was posted in Colorado Legislature, Education, Fiscal Policy, Legal Issues, Media, TABOR news story, Taxes by thetabor. Bookmark the permalink.